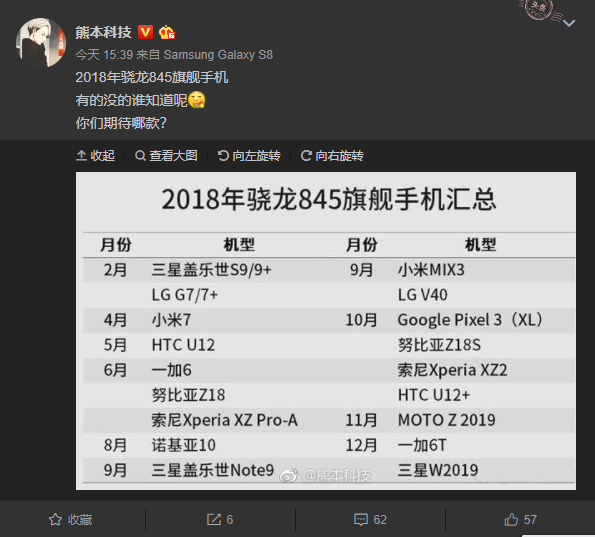 A list of upcoming smartphones that will sport the Qualcomm Snapdragon 845 has leaked on Weibo. The image was posted to the account Kumamoto Technology on Weibo. The list shows an array of smartphones that will be launched in 2018 with the Snapdragon 845. 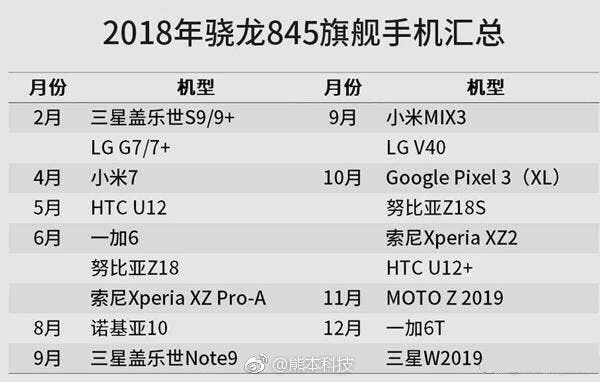 We already know that the 845 will adorn all the major flagships that will be launched in 2018 and the list says the same. As speculated, the Samsung Galaxy S9/S9+, Note 9 will sport the flagship chipset along with the W2019, successor to the W2018 flip phone. From the house of LG, the LG G7, G7+ and the V40, successors to the G6, G6+ and V30. Joining the ranks will be HTC’s U12 and U12+ along with Xperia XZ Pro-A from Sony. Xiaomi’s Mi Mix 3 and Mi7 will also sport the flagship processor. The Nubia Z18s, OnePlus 6, 6T, Google Pixel 3 XL will also sport the 845. From Motorola, only the Moto Z 2019 has been listed. Most of the phones listed are successors to the existing flagships, which is something that is not very difficult to predict. Even though the list seems believable, we suggest you take this news with a pinch of salt. 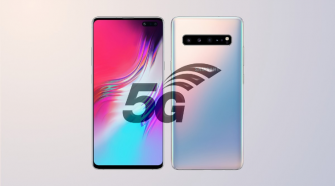 We will probably get to see more and more news regarding the upcoming smartphones around the last part of the first quarter. Watch this space for more.